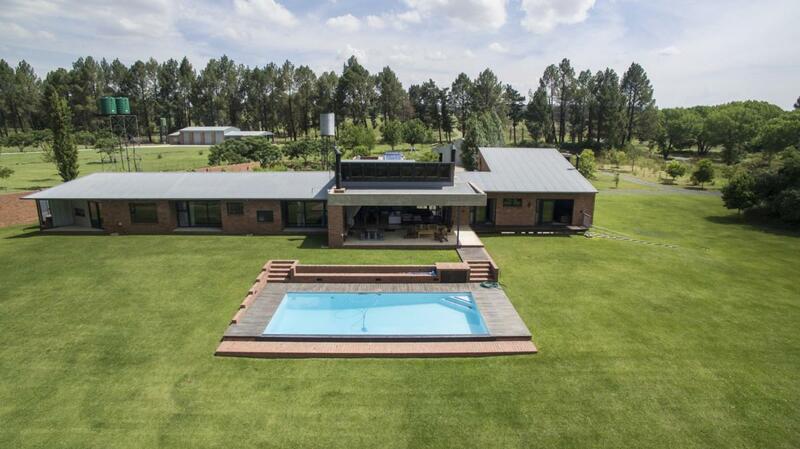 Earthy face brick – inside and out - is the standout feature of a modern holiday home on the Free State side of the Vaal River designed by Johannesburg-based Thorsten Deckler of 26’10 South Architects. This modern home with its eye-catching angles has been designed for weekend use and eventually early retirement for a family currently living in Johannesburg. “The site was extensively quarried for crusher run stone prior to the flood line being established in the 1970’s which rendered much of the site unbuildable,” says Deckler. Deckler said that the traditional double pitched roof had been manipulated to create additional volume, accommodation and light appropriate for a riverside holiday house. “The folded plane of the roof is functionally derived and aesthetically fine-tuned to create a modulated form that mirrors the horizon on the north but rises up to announce the house to visitors approaching from the south,” he explained. Red, earth-coloured brick walls without visible lintels and subtle window sills form a monolithic base capped by the thin metal plane of the roof. Musa Shangase, commercial director of Corobrik who supplied the bricks, said that clay face brick had been around for hundreds of years and was still the material of choice for contemporary architects because of its sustainable qualities and its natural visual appeal. “It fits the bill for long-term life performance, combining durability, longevity, low maintenance and energy efficiency with the capacity to provide a healthy indoor air quality and timeless natural beauty These are all valuable attributes for an upmarket, cost-efficient home designed to last as well as to blend effortlessly with a scenic riverside environment,” Shangase said. Shangase said that the brick used for the Vaal River house, Mahonie Satin, with its earthy tones, was no longer produced by Corobrik but that a similar, equally aesthetically appealing effect could be achieved with alternatives like Corobrik’s Redwood satin or Country Classic satin. Elaborating on the design of the house, Deckler said that the scullery, garage and staff quarters were docked perpendicularly onto the main house resulting in an arrival courtyard and a more sheltered private courtyard. The garage had doors on both sides, connecting the two courtyards and forming the ideal venue for informal activities such as table tennis matches and teenage discos. He explained that the existing trees, flood line and contours had provided the parameters for the positioning of the house and informed proposals for landscaping including the siting of a concealed access track to the boat launch which was located between two very tall existing trees. The solar installation on the garage roof, the water tanks and tower were treated as straightforward exposed utilitarian elements, albeit sited with care. Rain water was used in combination with borehole water and was piped in a closed insulated system ensuring hot water on tap at any point. An outdoor bathroom off the main bedroom was simply housed in a corrugated metal enclosure which can be opened up to afford views of the river. Deckler confirmed that the finished building fulfilled all his expectations and that he planned to enter it in the next SA Institute for Architects Awards.